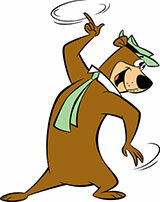 Yogi Bear’s Jellystone Park™ Camp-Resort provides overnight camping facilities for families. We request your assistance in maintaining a clean, fun, and friendly environment. The following information is provided for your personal safety, privacy and convenience. The Camp-Resort visitor assumes all risks and danger incidental to the activity of camping in a rustic outdoor environment including, specifically (but not exclusively), the danger of being injured by insects or other animals, of being injured while participating in recreational activities, such as hiking, bicycling, or swimming at the Camp-Resort or of being injured as a result of inclement weather conditions, and agrees, by entering on to the property known as Yogi Bear's Jellystone Park™, that the Camp-Resort and its owners, agents and employees are not liable for injuries or property damages resulting from such causes. Reservations at Jellystone Park™ are free! 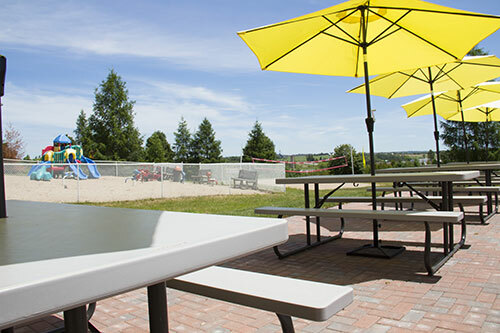 A $50.00 deposit is required on all campsite reservations, $100.00 deposit for Canadian Habitats and a deposit of 50% of your stay for Trailer Rentals. A valid Visa or Master Card number is required at the time of making a reservation. Amounts charged to credit cards will be processed at the time of making your reservation. We do not accept cheques. Please note the credit card holder must be present at the time of check-in. NOTE: A security deposit is required at the time of check-in for Canadian Habitats and Trailer Rentals (please see below for details). The person renting a Habitat must be a minimum of 21 years of age and be able to provide a valid drivers license. A valid Visa or Master Card number and expiry date is required to take your reservation. A $100.00 deposit is required on all reservations. This amount will be processed immediately. The credit card holder must be present at the time of check-in. A security deposit of $300.00 is required at the time of check-in. This deposit is taken as a hold on your credit card and will be credited back to your account in a maximum of 7 business days from your departure date granted that there is no damage at check out. (Pre-paid credit cards or Visa Debit cards are not accepted). You must provide a valid driver’s license so a copy can remain on file. The person renting a Trailer must be a minimum of 21 years of age and be able to provide a valid drivers license. A deposit equal to 50% of your stay is required on all reservations. This amount will be processed immediately. A security deposit of $300.00 is required at the time of check-in. This deposit is taken as a hold on your credit card and will be credited back to your account in a maximum of 7 days from your departure date granted that there is no damage at check-out. (Pre-paid credit cards or Visa Debit cards are not accepted). There is a $50 cleaning fee for any trailer left in a disorderly manner. Campsite Cancellations: If 7 days or more notice is given on a cancellation, you will be refunded $30.00 of the deposit and retain the other $20.00 as an administration fee. If you fail to give 7 days notice on a cancellation or do not arrive, we will retain the full $50.00 deposit. Habitat Cancellations: If 14 days or more notice is given on a cancellation, you will be refunded $80.00 of the deposit and we will retain the other $20.00 as an administration fee. If you fail to give 14 days notice on a cancellation or do not arrive, we will retain the full $100.00 deposit. Trailer Rental Cancellations: An administration charge of 1 night will apply to all cancellations. If you fail to cancel 14 days in advance or do not arrive, we will retain the full deposit. If you have made a reservation for more than one campsite and would like to cancel a site, we are unable to transfer the deposits and the cancelled site will be charged the cancellation fee. Please note: Maximum length on back-in trailer sites is 36' and a maximum of 1 slide out on passenger side. Child Accompaniment: Children must be accompanied by an adult at all times, including: swimming pool, recreation program, playground, laundry room, ranger station, mini-putt, restrooms, and showers. Late Arrivals: For your comfort and convenience, only campers with reservations are admitted into the park after 11:00 p.m., unless by prior arrangement. After 12:00 a.m. we do not admit anyone in the park who has not previously registered and set up their campsite, unless by prior arrangement. Please note, late arrival habitat walk-ins are not available. 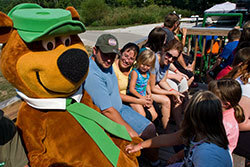 Special Terms and Conditions: During In-Season, Yogi Bear’s Jellystone Park™ Park is fully staffed and offers its full range of facilities and activities. During Pre-Season and Post-Season staffing is limited and some facilities and activities may not always be available. We offer discounted rates during these periods in recognition of the seasonal nature of our business and our dependency on Mother Nature. These special rates are not valid with any coupon offer or other discount. Minimum 3 Night Stay on Long Weekends: There is a 3-night minimum stay on all long weekends (Friday check in to Monday check out). There will be absolutely no refunds given after check-in on any site. Checked-In Cancellation Policy: See Customer Service. Exchange Rates: Our published rates are shown in Canadian Dollars. Please note, when you use your credit card or debit card, you will be charged in Canadian dollars. Your credit card company converts the Canadian dollar amount into the currency of your home country on your monthly statement at an exchange rate determined by your credit card company. It is always best to buy Canadian dollars at a Canadian bank for the best possible exchange rate of the day. The good news is that regardless of the exact exchange rate, the U.S. dollar goes a very long way at Yogi Bear's Jellystone Park™. Notice of Harmonized Sales Tax (HST): Please note that as of July 1st, 2010 the Province of Ontario and the Federal Government plan to implement a new Harmonized Sales Tax (HST). The HST system will replace the current 8% Provincial Sales Tax (PST) and 5% Federal Goods and Service Tax (GST). The HST system will charge a total rate of 13 per cent, which includes the Provincial and Federal portions. Currently PST does not apply to camping fees, however as of July 1st, 2010 HST of 13% will apply to camping fees in the province of Ontario.